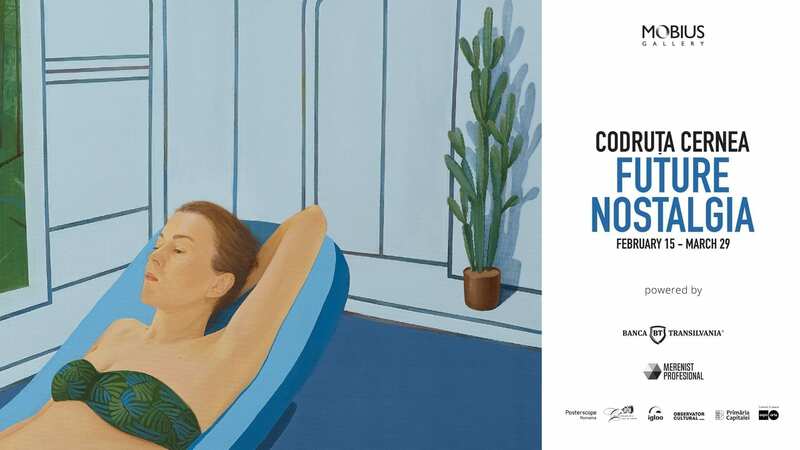 Mobius Gallery is pleased to present “Future Nostalgia”, an exhibition of new paintings by Codruța Cernea, on view from February 15th to March 29th, 2019 at Mendeleev D.I. Street, #2, Bucharest. This is the artist’s first solo show with Mobius, Codruța Cernea joining the gallery program in the beginning of 2019. An opening reception will be held held on Friday, February 15th from 7 – 10 pm. The exhibition catalog will be launched during the show. The release date will be announced soon. In “Future Nostalgia”, her newest series of artworks in synthetic polymer paint on canvas, Codruța Cernea syntheses in a mature fashion, forms and contents previously explored in her artworks. Iconic images of insular space resorts surface in flat shapes of tinted colours and shaded brush textures and immerse into this fantasy world. Her characters become benevolent space tourists on Earth and their failing project to sustainably artificialize organic life cycles – an imperative to rediscover the ecstatic enjoyment of natural landscape, with herself becoming the architect of this floating island of alternative history. Codruța’s practice is giving form to the latent intersubjective realities of today, so that interiorities populated by empty words are opened to self-reference. Her works are improbable emotional surfaces of revolution carried by the psychological forces of our collective imagination and whose thrusts are dependent on determining the things one wouldn’t want to live without. The only past that ought to matter is our tomorrow imaginatively lived and pondered in an endless series of tomorrows. The vernissage is going to be photographed and/or video recorded. The photos and videos will be used by Mobius Gallery to promote their cultural activity, the materials will be published on social networks. By your presence, you consent to be photographed and/or filmed as well as for the use of the materials for the above-mentioned purpose.